I have always had a special interest in Linzer cookies. They are, obviously, Linzer. I am and Lindsey. But I rarely ever make them (I just eat them). Which is a crying shame because they are beautiful, delicious, and fun to make! I love the little window in the sugar-coated top cookie to let the delicious filling peak out. That filling is typically raspberry jam. Now, I love some good raspberry jam as much as the next girl, but you know what would be better? And these Nutella Linzer cookies are absolutely perfect for Valentine's Day! They have everything you need! A little sugar, a little chocolate, a heart cut out. Do you need anything else? The cookies that make up the Linzer are traditionally made with almond meal. However, using pure almond meal would result in a very crumbly and hard cookie. These cookies are a mix of my favorite sugar cookie and an almond cookie so that they still have that great almond flavor and texture, but aren't overly crumbly or tough. After the dough has been mixed, dump it out onto a sheet of plastic wrap and wrap it up into a ball. Chill in the freezer for 20 minutes or until it's slightly firm. This will help you roll it out into a nice even sheet. 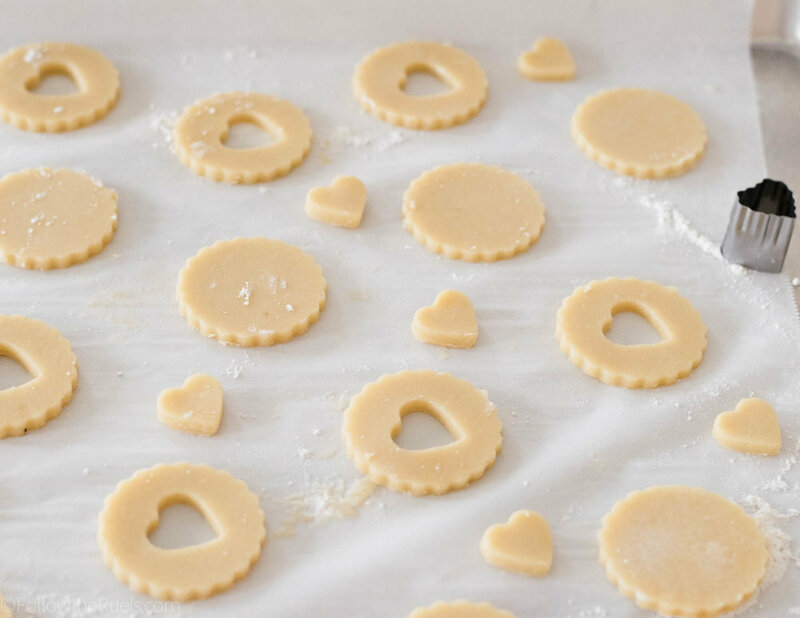 Since the dough is rather soft, it would also help to chill the dough after it's been rolled out which will help create evenly shaped cookies (which is pretty important when you are making cookie sandwiches). I like to roll my dough out on a sheet of parchment then transfer the parchment to a baking sheet, then the baking sheet to the fridge. After a few minutes, the dough should be firm enough to cut out into shape. Cut out circles (or whatever shape you like), then cut out the window in every other cookie. In this case, I used a small heart cookie cutter. Once the cookies come out of the oven and had had a chance to cool, match them up to find a tip and a bottom that are of similar size. Dust confectioners sugar over the top cookie and spread the Nutella over the underside side of the bottom cookie. Finally, reunite the top cookies with the bottom cookies to create delicious Nutella Linzer cookies. In a large bowl, beat together butter and sugar until light and fluffy. Add in egg and vanilla, then mix to combine. Add flour, almond meal, and salt to the bowl and mix until flours have been evenly incorporated into the dough. Turn dough out onto a sheet of plastic wrap. Wrap into a bowl and let chill for 20 to 30 minutes. Roll dough out on a sheet of parchment paper to 1/8th inch thick. Transfer the sheet of parchment and dough to a baking sheet. Place the baking sheet in the fridge to chill the dough for another 5 to 10 minutes. Cut out 24 evenly shaped cookies. In half of the cookies, cut out a window. Bake for 15 to 17 minutes, or until lightly golden brown around the edges. Separate the tops and the bottom cookies. Dust confectioners sugar over the top cookies and spread the Nutella over the underside of the bottom cookies. Place the top cookie on top of the bottom cookie to make a sandwich. Serve immediately or store in an airtight container. If you have to stack the cookies, place a sheet of parchment between.